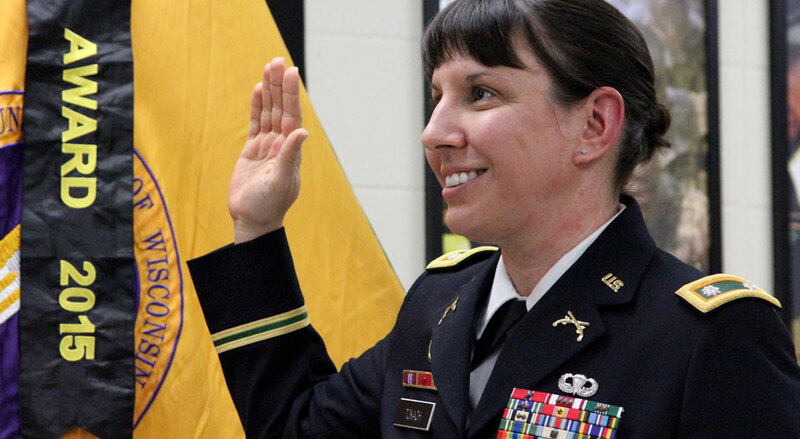 LTC Wendy Tokach is promoted from major to lieutenant colonel. Born and raised in Mandan, North Dakota, LTC Tokach enlisted in the North Dakota Army National Guard in 1995 as a photojournalist. Since then, she has continuously moved up the Army ranks in leadership positions which also included two Iraq deployments. LTC Tokach joined the UW-Stevens Point cadre in August 2017 . Prior to arriving on campus, she had the unique opportunity to serve as the G3 Operations and Training Officer for two years with the Canadian Army Military Police Group in Ottawa, Ontario, as part of the Military Personnel Exchange Program through the U.S. Army Military Police School and U.S. Army North. LTC Tokach’s awards and decorations include the Bronze Star (1 OLC), Meritorious Service Medal (3 OLC), the Army Commendation Medal (2 OLC), Army Achievement Medal 2 OLC), Valorous Unit Award, Meritorious Unit Award and the Parachutist Badge. In addition she is the recipient of the Military Police Regimental Order of the Marechaussee in Bronze.